Deep in the Forest of Fear, an angry sorceress, Meevillain, casts an ominous Cloud of Chaos across the Kingdom of Kindness. Unhappiness and mistrust spread among the people of the kingdom. Walls spring up around each village, and misunderstandings keep the villagers from remembering life before the shadowing cloud. Young Princess Shayna nearly dies from Meevillains Sinister Sleeping Spell. Sigmund, the Royal Wizard, saves the princess, but she must take a Silver Apricot Potion every day stay to alive. On her 13th birthday, Princess Shayna embarks on a perilous Vision Quest to unite the Kingdom of Kindness. For the first time in her life, she is without her parents reassuring guidance. Princess Shayna encounters treachery and deceit, as well as new friendships and kindness. She learns about the villagers Praiseworthy Gifts and helps them appreciate and respect each other again as she shares her Invisible Visible Gift of self-esteem. But before the Kingdom of Kindness can be whole again, she must face her deepest fear! 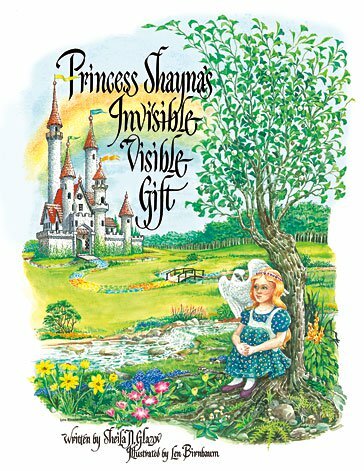 Like all enduring fables, Princess Shaynas Invisible Visible Gift combines exciting storytelling with a powerful message that remains long after its reading. These skills have helped thousands build a firm foundation to solve their problems and savor their joys while on their life-long journey of self-discovery. The Gift Givers Guide at the back of the book helps to start conversations and encourages children to talk about how the story and characters relate to their own real-life experiences. Every child deserves to feel loved, safe, encouraged, and confident in a trustworthy home, school, and community environment! 10% of the royalties from the sale of this book are allocated to diabetes research and education. Visit www.PrincessShayna.com for more information.